When you have no time, but want a really delicious and warming bowl of soup, this is the recipe for you! It’s embarrassingly simple to make, but has great flavors. In a large dutch oven, add olive oil and diced onions. Cook until onions are translucent over medium heat, about 3-4 minutes. Then add minced chipotle peppers (opt.) and garlic. Stir to combine. Add in drained and rinsed black beans, corn, and tomatoes along with vegetable stock. Bring to a simmer. Add in chopped corn tortillas and simmer on low for 10 minutes. Tortillas should mostly dissolve. Season soup well with salt and pepper. 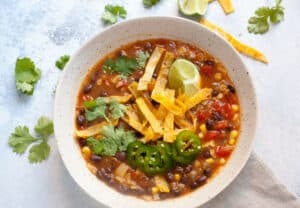 Serve soup with any all garnishes you want, but most importantly crispy corn strips (or corn tortilla chips in a pinch). Preheat oven to 350 degrees F. Slice corn tortillas and toss with olive oil, chili powder, salt and pepper. Spread them out on a baking sheet lined with parchment paper. Bake corn strips for 15 minutes, stirring once halfway through. Remove corn strips and let cool. They will continue to crisp up as they cool. Freeze this soup by letting it cool down to room temperature. Then transfer to freezer safe bags. Stores in the freezer for up to 3 months. Reheat slowly on the stovetop. This delicious recipe was brought to you by Macheesmo. Read the full post at https://wp.me/pkSYO-eMs.